The organization wanted to maintain brand consistency with one main email signature for its employees. This signature would have to conform to brand guidelines and maintain the professional image that it exudes to its customers. 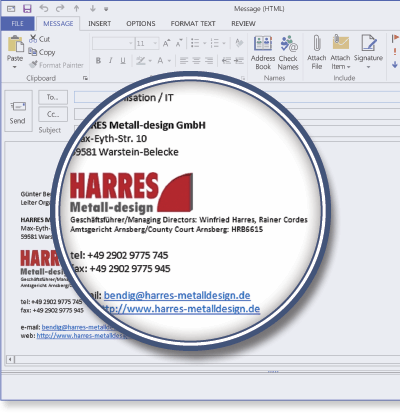 Upgrading from Mail Utilities to Signature Manager Exchange Edition gave HARRES Metall-design GmbH the most up-to-date version of Exclaimer’s award-winning Exchange email signature software, complete with a host of powerful new features. HARRES Metall-design GmbH is an organization that specializes in the manufacturing and distribution of metal shop fittings. Based in Warstein-Belecke, Germany, its products are used by various retail segments such as food, fashion, sports and healthcare. In addition, it also creates robust brass and stainless steel components for the automotive industry. Trading since 2004, HARRES Metall-design GmbH has grown considerably under the leadership of its two managing directors, Winfried Harres and Rainer Cordes. Employee count has increased by 50% and its representatives take part in regular tradeshows such as Euroshop in Dusseldorf. With a focus on becoming the leading supplier of metal components and system solutions for shop fittings, its success can easily be traced to the high quality of its product range. All organizations need to use strong branding that stands out from ‘the crowd’ and is unique enough for people to easily remember. Whether it be the logo, typeface or corporate message, there can never be any inconsistencies in the way that a brand is represented. It is surprising how many major organizations forget that email signatures are just as important to their brand identity as letterheads and business cards. When a poorly designed email signature is viewed by a customer, it can create negative brand connotations and look unprofessional. For HARRES Metall-design GmbH, its brand is a key part of its reputation. The organization understands the importance of email signatures as another way of showing the quality of its brand to clients and customers. Therefore, having a single uniform signature for all employees has always been of paramount importance. The use of dedicated software allowed the organization to achieve this through working with Exclaimer and using Mail Utilities to process all signatures via its Exchange server. However, the software was only designed to work with Exchange 2007 and 2003, meaning that it was no longer the cutting-edge product it once was. Having used the software for a number of years and utilizing Exchange 2013, it was time for HARRES Metall-design GmbH to upgrade to the latest version of Exclaimer’s award-winning Exchange software, Signature Manager Exchange Edition. Signature Manager Exchange Edition is much more advanced than its predecessor, Mail Utilities. With one of the main features being that employees can have full HTML signatures on all devices, it was a simple choice for HARRES Metall-design GmbH to upgrade their current software package. “The sales process was simple, fast and effective,” stated Günter Bendig, IT Manager at HARRES Metall-design GmbH. “We had been using Mail Utilities since before I joined the company, but I was aware of Exclaimer’s positive reputation.” Wanting to make sure that he was able to use the software properly, Mr Bendig was shown comprehensive resources that would help to answer any of his questions, making the install process as simple as possible. This meant the software was installed quickly with no service interruptions. Once Signature Manager Exchange Edition was ready to go, Mr Bendig knew that it would save him hours of email signature administration, with no need to visit every employee’s machine to update signatures manually. Upgrading to a new software application can be a tiresome exercise if there is no inherent value in doing so, leaving customers thinking that they are being asked to pay additional money for something they already have. Signature Manager Exchange Edition was deemed to be a worthwhile purchase for Mr Bendig due to all of the new features available, the fact that it runs with the latest version of Exchange and how it does not require any database maintenance. Once the software is set up, it is simple to create a signature and deploy it without getting an end user to do anything with their Outlook client.